The linen draper's, Spencer, Turner and Boldero, became properly established around 1855 when three independent Master drapers, all working on Lisson Grove, joined together to form one larger firm. From this date on the business expanded rapidly, eventually employing several hundred assistants and needlewomen. This page was added on 07/05/2011. I was aged 15 in 1957 and my first job was at Spencer Turners as a van boy. We delivered clothes and sundries all over london no traffic -great times. I worked at Spencer, Turner & Boldero's from 1941 to 1947 in the child's wear department. I worked with Joyce Davis (nee Weatherhead) who had two children called Lyn and Tim. It was bombed in the war and I was watching from the flats opposite (Hubert House - Marylebone Housing Assoc); the fire was very fierce and the big red ledgers were blown through the windows of our flat. I worked at Spencers from when I left school in the 60s until they closed down. I remember it being a happy place with many local people working there and some people living in company accommodation. I remember there still being gas lights in some parts of the building - though they were trying to modernise. The building had many odd corners and rooms, where some of the buyers would keep secret stocks of drinks for their mason friends. I remember 'Tiny' who used to look after 'goods inwards' - there were many characters there. I worked in Fancy Linens most of the time selling things one never sees now. I worked at Spencer, Turner & Boldero's for 22 years. Mr. Noakes was such a lovely person as were the majority of the people who worked there, for STB's was a real family company. Such a pity Mr. Tom (as he was known) had to retire when he did. My sister in law worked there. Her name name was Doreen Patching and she married Len Bunn who I think also worked there. my mum Jessie Watkins also worked there with a friend of ours Cora Barker. Doreen & I didn't work in the same department, but I knew & liked her very well. Always ready for a laugh & very helpful to anyone who needed it. We once & only once had a Firm's Outing, Guess who kept us all entertained? Lovely person. Spencer, Turner & Boldero had a massive packing department. I remember Doreen well, I believe she was in charge of the E to J section of the packing department. The packers, mainly ladies, were a good hardworking crowd. Doreen was always a very jolly person and got on well with everyone. The majority of the workers were either local or from nearby Paddington. The company had old fashioned values, that the majority of the workers appreciated. Is there anyone around who remembers Paddy's Café in Lisson Grove? That's where we all went for our teabreak. What would Paddy and his love wife Gladys done without the workers from Spencer, Turner and Boldero and of course the local dustmen? Oh this brings back memories. 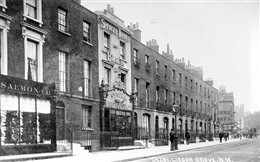 My grandfather was W.T.Cook a credit draper whose shop was 1 Harcourt Street Marylebone. We all visited Spencer, Turner and Boldero's on Lisson Grove. Mum and Dad went into the business when we were children independently from my grandfather. Just yesterday guests staying in our B and B mentioned Lisson Grove and I knew that name was familiar. Mum, now 96 years just couldn't place where she knew the name from, but I was so sure this is where I would go with them to the warehouse in the 50s. Ann. When i was a child my Dad had a shop in the Harrow Road in the 1950s and he used to take me to Spencer's to buy wholesale. I loved the place with its dark corners and odd little departments. The people who worked there were always friendly to me and every year while we were there he would buy me pretty Land o' Nod pyjamas.